CMS Mobile will come and service your leisure vehicle at home, in storage, on site, in fact anywhere! Never again will you have the inconvenience of having to take your leisure vehicle to a dealer. 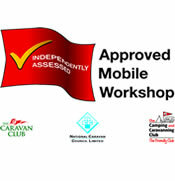 Save your time and your money by calling in CMS Mobile, a member of the National Caravan Councils Approved Workshop Scheme which assures you of a quality service experience. Please feel free to browse this website, as you can see we supply and install a vast amount of different products, if you are after something that is not stated then please contact us to see if we can help. CMS Mobile covers a vast geographical area which includes; Yorkshire, North Derbyshire, North Nottinghamshire, North Lincolnshire, Teesside, County Durham, and Humberside.